The term 'eating disorders' is generally used when referring to the two main eating problems encountered medically namely anorexia nervosa and bulimia nervosa. Although they are usually categorised as separate conditions, patients usually have elements of both problems. Indeed, people with anorexia nervosa (or anorexia) may suffer for many years and then develop bulimia nervosa (or bulimia). These disorders are ten times more common in women than men, usually beginning in teenage years. • Peer pressure. We live in a Western culture where a thin body is highly prized, dieting is impressed on people through the media from a young age, and where most of us are tempted to conform to the 'ideal' shape that advertising suggests we should all be for happiness and success. • Self-control. During the years of puberty, the ability to control your own weight can be one of the few things adolescents and teenagers feel they have an element of control over. A simple desire to lose a few pounds can therefore become an end in itself, with the control involved in weight loss being the trigger for further dieting. • Family pressures. Refusing food may be the only way someone feels they can generate a response! This may be the only way a teenager feels able to make their feelings heard at home at this time. • Depression. This may be commoner in people with bulimia, as many such sufferers have a degree of depression initially. Eating binges can be a way of coping with depression, but the subsequent feelings of guilt can make depression worse. • Hormones and puberty. Very thin girls or girls with anorexia can appear to try to prevent sexual maturation by dieting since this can delay periods and the development of breasts and other sexual characteristics. Unfortunately this can lead to a 'Catch-22' situation, since this prevents them from developing the very maturity needed to help cope with the problems of growing into adulthood. • As a reaction to upsetting events. Parental divorce, splitting up with a boyfriend, or bullying can all trigger eating disorders as a reaction to them. Usually beginning in the teens, but occasionally earlier or in the 30s and over, this affects one fifteen year old girl in every 150. It tends to be commoner in girls from professional family backgrounds rather than working-class backgrounds, and there may also be a family history of eating disorders. It almost always starts with simple dieting (although the appetite remains the same - an important point) and a fear of fatness. Exercise may increase dramatically in an attempt to burn more calories off, and there may be attempts made to cover up how little food is being eaten. Clothes may be worn baggy and loose to disguise the amount of weight lost, and an unmistakable symptom in a girl is that her periods stop once her weight has fallen about 12 kg below normal for her height. As time progresses, some symptoms of bulimia may develop such as vomiting and laxative abuse. But, unlike 'pure' bulimia, the weight will always remain very low. Most anorexics are consumed or obsessed with food, weight, counting calories, and prolonged exercise routines. 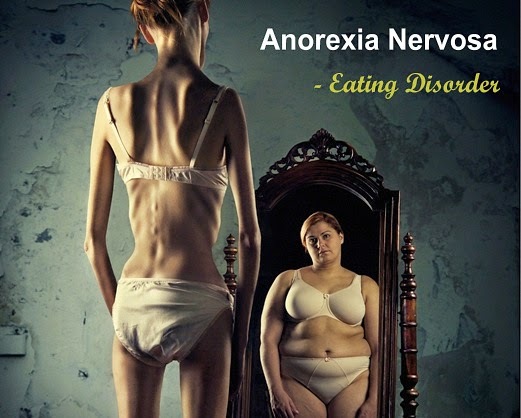 Anorexia nervosa is a serious life-threatening condition that needs to be addressed by a trained medical doctor. This tends to affect a slightly older age group, often women in their early 20's who have been overweight when very young. Like people with anorexia, they have a fear of fatness but unlike them their weight is not always abnormally low. This is because people with bulimia 'binge eat', alternating eating large quantities of fattening foods (crisps, chocolates, puddings and biscuits for example) with self-induced vomiting shortly afterwards along with laxatives and/or diuretics abuse to try to lose weight. This sets up a cycle of guilt and depression from which is difficult to break out, and which controls their lives. Periods are irregular rather than absent compared to people with anorexia, and it can sometimes be a relief for people with bulimia to admit to their problem since keeping up the pretense of normal eating and maintaining an active social and working life is a huge strain. Some bulimics use laxatives and/or diuretics as a means to control weight. Bulimics are not necessarily skinning or thin. Like the anorexic, the bulimic has an unrealistic evaluation of themselves when it comes to assessing their own weight or personal self-image. Like anorexia, bulimia nervosa is a serious life-threatening disorder that needs to be addressed by a medical professional. Will I Have Any Tests Or Investigations? There are no specific 'eating disorder' blood tests or investigations available, although your doctor may want to do some baseline blood tests to check for anaemia, thyroid problems or other causes of weight loss or tiredness. In the vast majority of cases however, the diagnosis is made by a combination of the history, examination of the patient and corroborating facts from family or friends. In a person with anorexia whose periods have stopped and in whom the illness has been recognized, the first aim should be to ascertain a 'normal' weight for that person and set up a programme to try to attain it. This involves regular mealtimes and checking what is being eaten, if that person is still living at home, as well as allowing them to talk freely about any problems which are upsetting them as well. Regular psychiatric appointments are very useful not only for the sufferer but also for the rest of the family - having a person with anorexia in the family can be extremely stressful for everybody concerned. It is only if there is no progress, or if the level of weight loss threatens the life of that person that hospital admission is normally considered. Treatment here is much the same as at home except it takes place in a much more structured and ordered environment, and the person with anorexia may feel 'safe' there compared to home. Most people with bulimia have left home since they tend to be older, and so the aim of their treatment is always to have three regular meals each day and maintain a steady weight on this without vomiting or starving. Psychotherapy treatment, antidepressant medication and dietary advice may all be useful to help achieve this, sometimes with regular psychiatric input as well on an out-patient basis. 1. Recognition. It sounds obvious, but an eating disorder has to be recognized before it can be treated. People with anorexia are usually noticed by family and friends - they are concerned by them losing weight and continuing to do so. The person with anorexia usually refuses to believe there is a problem, and continues to think they are fat or overweight, hiding their lack of food by eating large quantities of 'healthy' food such as filling a plate with lettuce. People with bulimia often admit to their problem when in a new relationship or if they have to live with other people. Here, the strain of their binge eating cycle is too much to hide and so they tell someone they trust what they are doing. 2. Referral. Most family doctors do not have the expertise to treat eating disorders purely by themselves and so refer on to psychiatrists or psychologists. This is best done quickly - the sooner the better. 3. Assessment of the problem. Once seen by a specialist, an in-depth assessment is made as to the duration and severity of the eating disorder and its underlying cause(s). This usually involves talking to family and friends to obtain independent confirmation of the problem. 4. Treatment - as above. Many people with eating disorders feel they are the only people in the world with their problem, and so find self-help groups extremely useful. These also have the benefit of not being linked to family or friends and so talking in them can be easier than it otherwise might be. Your GP should be able to recommend local groups. It is also vital that you talk about your feelings to someone you feel comfortable with - do not bottle them up as this can trigger eating problems all over again. 1. How long have you been especially concerned about your weight? 2. Do you ever make yourself sick or take laxatives? 3. How often do you weigh yourself? 4. Have your periods stopped? 5. Do you think you are underweight? 1. What weight should I be for my height? 2. How quickly will my periods return if I put on weight? 3. Are there any particular foods I should eat more of? 4. Will my stomach have shrunk? 5. Will any medication or tablets be of any help to me?